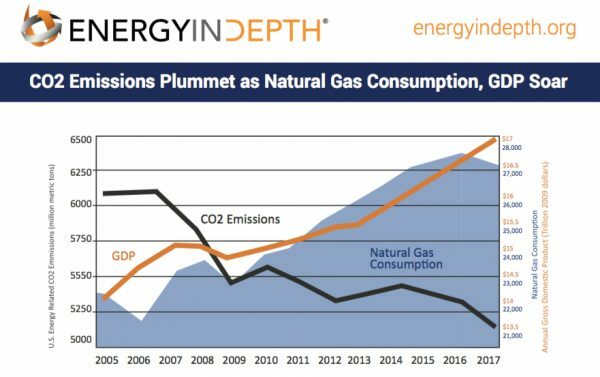 The Energy Information Administration reports natural gas-fired electricity generation continues to increase as CO2 emissions continue to drop as a result. The Energy Information Administration (EIA) reported yesterday that natural gas-fired electricity generation is up again and continues to grow. Meanwhile, our CO2 emissions are down to 1992 levels when our Gross Domestic Product was but a third of what it is today. It’s no coincidence. 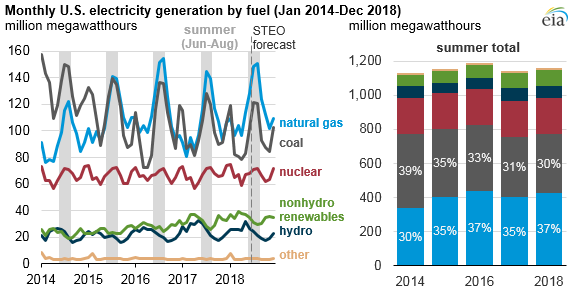 EIA’s July 2018 Short-Term Energy Outlook (STEO) expects natural gas-fired power plants to supply 37% of U.S. electricity generation this summer (June, July, and August), near the record-high natural gas-fired generation share in summer 2016. EIA forecasts the share of generation from coal-fired power plants will drop slightly to 30% in summer 2018, continuing a multi-year trend of lower coal-fired electricity generation. The share of electricity generation supplied by natural gas-fired power plants has increased over the past decade, while the share supplied by coal has fallen, primarily as a result of sustained low natural gas prices, increases in natural gas-fired capacity, and retirements of coal-fired generating capacity. Over the three-year period from 2015 to 2017, the cost of natural gas delivered to electric generators averaged $3.16 per million Btu (MMBtu), compared with $7.69/MMBtu between 2006 and 2008. The combination of relatively low natural gas prices, environmental regulations, and supportive renewable energy policies has led the industry to build new natural gas-fired and renewable capacity and to retire coal-fired power plants. As reported on EIA’s Preliminary Monthly Electric Generator Inventory, power plant operators added 5.4 gigawatts (GW) of new natural gas-fired generating capacity during the first four months of 2018 with an additional 15 GW scheduled to come online through the end of the year. This addition would be the largest increase in natural gas capacity since 2004. The electric industry also added 2.6 GW of new utility-scale solar and wind generating capacity during the first four months of the year, with an additional 9.6 GW scheduled to come online by the end of 2018. More than 10 GW of coal-fired capacity was retired over the 12-month period ending April 2018. EIA forecasts the delivered cost of natural gas will average $3.16/MMBtu this summer, 2% lower than the average cost during the summer of 2017. In contrast, the cost of coal delivered to electric generators is forecast to rise slightly this summer. The continued low cost of natural gas, along with the recent additions of natural gas-fired capacity and retirements of coal power plants, drive EIA’s expectation that natural gas will contribute a growing share of electricity generation this summer, while coal’s share will fall. New Energy Information Administration (EIA) data released this week show that U.S. per capita carbon dioxide (CO2) emissions are at their lowest levels since 1950. As the second column from the right from the following EIA chart shows, 2017 U.S. per capita CO2 emissions were 15.8 metric tons per person, their lowest levels in 67 years. Interestingly, the data also shows emissions per real dollar of gross domestic product have declined to their lowest point ever. 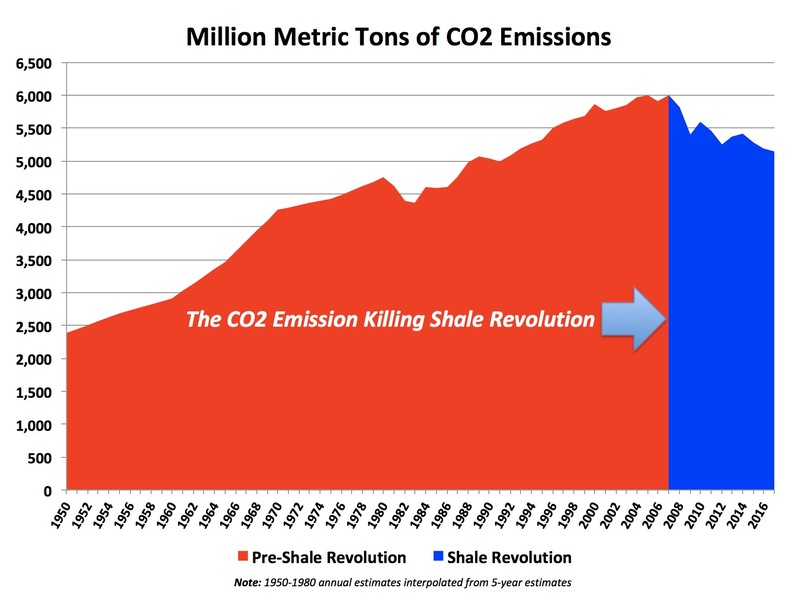 Measured in something called “chained million dollars” at the 2009 value of a dollar, metric tons of CO2 emissions have declined from an estimated 1,091 in 1950 to 301 in 2017. That’s a 72.4% drop over the 67 years meaning things have been getting steadily better, not worse, thanks largely to energy efficiency gains and things such as nuclear energy, natural gas and, yes, even renewables. We’ve simply gotten a lot smarter about the way we produce and use energy. 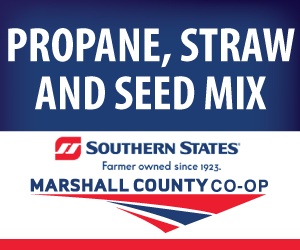 The post Natural Gas-Fired Electricity Generation Up; CO2 Emissions Down appeared first on Natural Gas Now.